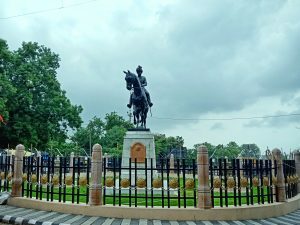 There in the middle of the roundabout stands majestically a bronze statue of Maharaja Sir Shri Vijaysinhji on horseback, resplendent in his regalia. Born on 30th January 1890, Maharaja Vijaysinhji was the 36th and last Gohil Rajput ruler of Rajpipla State from 1915 till merger with the Indian Union in 1948. He was the builder of modern Rajpipla town, at the head of which was erected his statue after his demise in 1951. Maharaja Vijaysinhji’s reign was the culmination of the 600-year sway of the Gohils over Rajpipla. A statue of this nature is appropriate in more ways than one, for apart from having carried out numerous works of public utility, Maharaja Vijaysinhji was arguably India’s greatest racehorse owner, having secured a unique hat-trick of Derby wins, the first-ever Indian Derby in 1919 (horse Tipster), Irish Derby in 1926 (horse Embargo), and crowning his racing career with the English Epsom Derby (horse Windsor Lad), considered the greatest horse race in the world. Even today people congregate at the chowk to pay homage to Maharaja Vijays. 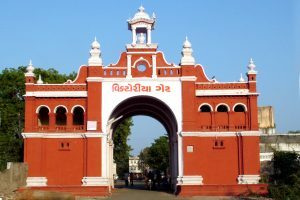 The voctoria Memorial Gate was constructed by Maharana chhatra Singji opposite the past old Palace and the present S.T. Depot.This archway has the Statue of Queen Victoria on the top was to commemorate her rule as Empress of England and the Indian Empire.